Can you see the goldfinches on the feeder? Goldfinches are my favorite birds. I love how they flit around and “sparkle” in the sun. 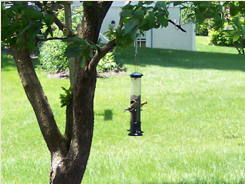 There are a lot of goldfinches in my neighborhood and they flock to my feeder year round. The feeder hangs in a dogwood tree very close to my front window, so I can watch them up close and personal. Spring is at its full glory here in southcentral Pennsylvania. The trees are full of leaves, the azaleas are in full bloom, and the grass is green and growing so fast you can almost see it getting longer. I love all the green after the long winter. Green is one of my favorite colors. But some shades of green just aren’t my cup of tea. I’m not very fond of yellowish greens, like chartreuse. I haven’t always disliked chartreuse. When I was eight years old, I got a new coloring book and a box of 32 Crayolas. The coloring book was out of this world, filled with pictures of a mother doing household chores like cooking, running the sweeper, and ironing. Very appealing to an eight-year-old girl. ☺ And what eight-year-old doesn’t get a thrill out of cracking open a brand new box of 32 Crayolas? That was fifty years ago, and a lot has happened since then. One of the things that happened is that I lost my affection for chartreuse. It is no longer one of my favorite color and hasn’t been since I was, oh, nine or ten. LOL Perhaps you, dear readers, love chartreuse. That’s wonderful. It is a perfectly good color, but it’s just not for me. 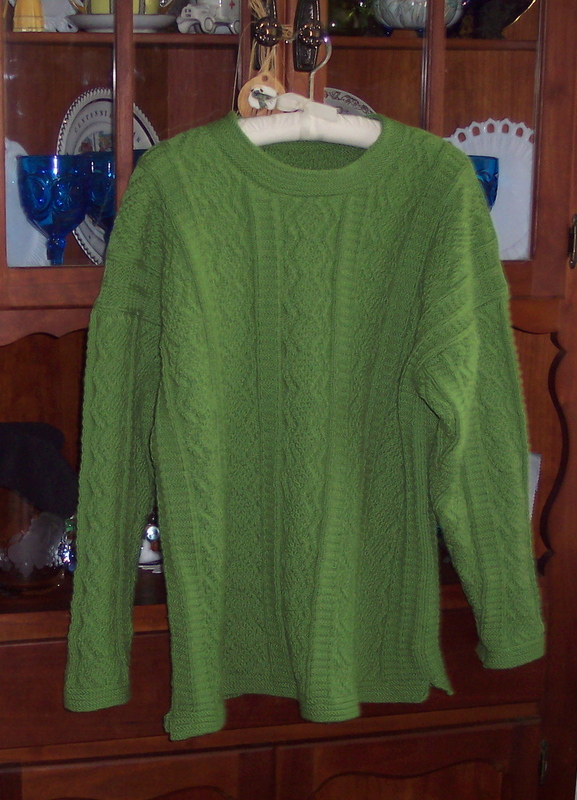 Now, as you know, I have been knitting a sweater, Kinsale, in chartreuse yarn. You may be wondering why I have been knitting a sweater for myself in a color I don’t like. That is a good question. I wish I had a good answer, but I really don’t. I purchased the yarn with a different sweater in mind, and I wanted to make something that was colorful. 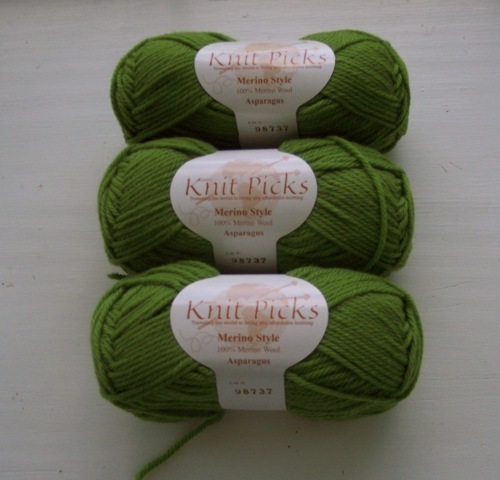 But I ordered from a color card and didn’t realize just how chartreuse Knit Picks Merino Style in Asparagus is. When I got the yarn, it took my breath away, and not in a good way. LOL Nevertheless, I thought I would give it a try. Maybe once it was knitted up, I would really like it. I ripped out the Gansey and set the yarn aside to use for another project. Fast forward a year. I decided to knit Kinsale, and thought the Merino Style in Asparagus would be the perfect yarn because I already had it. I swatched and thought the color looked great. Then I started knitting the sweater. The bigger the sweater got, the more chartreuse it seemed, and the less I liked the color. But I figured that I could always overdye it if I didn’t like it, so I kept plugging away. Whaddya think? Now that Kinsale is a finished object, I plan to let it be for a while and see whether the chartreuse grows on me. If it doesn’t, dye pot, here I come!